I grew up in a home where there was always clutter and borderline hoarding going on and it drove me crazy! Therefore, when I got my first place I vowed to as much as possible keep it clean and clutter free. My obsession with keeping things clean worked for me until I got married. My husband and I did not move in together until after we returned from the honeymoon. Somehow, blinded by love during our courtship I did not notice that his definition of clean was completely different from mine. Along with my wonderful husband came two beautiful girls who live with us on a part-time basis, who also had a different definition of clean. Prior to marriage, I was never home so of course things were always in order. In addition, there was no one else there but me so again everything stayed in order. After a couple of years of marriage, a one-year-old son, and seven and nine-year old daughters this little house of mine is now a home. It now has a family, is lived in, and it shows. The white walls now have crayon markings, the clean rugs now have stains, and so on. This post is not about cleaning as much as it is about me learning not to sweat the small stuff. They may never admit it to me, but I am almost certain I was driving my family crazy. There were times when the girls would just want to sit and play a game, but I would not because I “needed” to clean. There were times when my husband would just want to sit and enjoy a movie, but I would not because I “needed” to clean. Ten years from now, are they going to boast about and remember how immaculate our house was or will they remember the time spent with them. I think the latter. After all, what good is it to a have flawless home if the people in it are miserable. I would rather have a happy husband and children with a few marks on the wall than not have them at all. Do not get me wrong, I STILL want my house to be presentable, but I am learning not to stress over it. I did find a simple, realistic and manageable calendar to help me keep some order. It outlines a realistic amount of tasks to do daily, weekly and monthly. 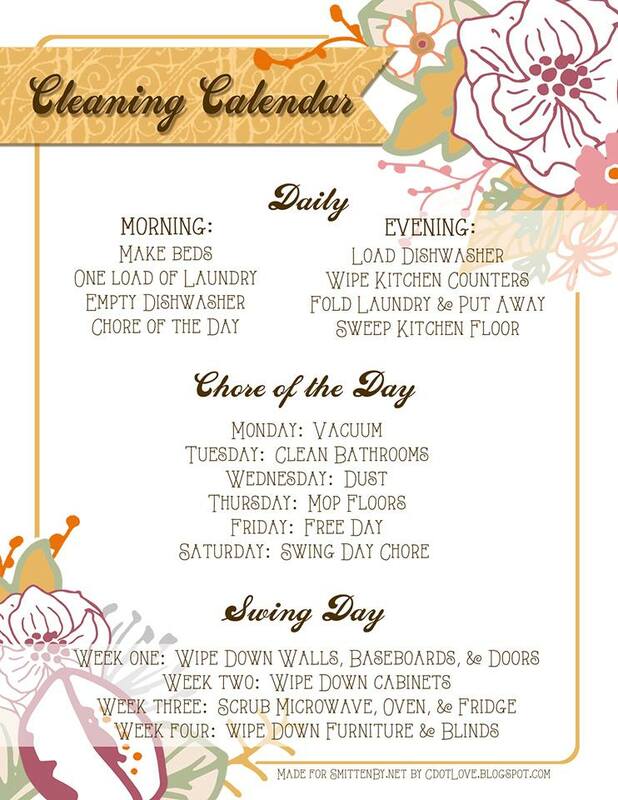 It is the Cleaning Calendar created by Kallie with Smitten By. If a day comes and I do not get to do what is on there, so be it. It is not the end of the world. I am not going to sweat the small stuff and hope you do not either! Here is the calendar I found. Visit the website to find other templates. Thank you so much Mel for the kind words! Thank you for visiting! Thank you for attaching that list. I’ve been looking for a schedule. You are very welcome! I hope it helps. You are so absolutely right! I had to check myself recently because J would come and grab my hand for me to go and do something with him and I found myself saying “hold on a minute” or “let mommy finish ” way too many times. I have to remember, these moments are precious and should be cherished. Like you, I lived alone until marriage. My house stayed clean. Now I have to remember, my house is only messy because I have a F-A-M-I-L-Y that lives here. What a blessing that is! Yes Shonika, family truly is a blessing! We can’t get so busy that we don’t slow down and smell the roses (or enjoy the things that matter the most).